Yep. David Hogg 2. Libs just won't give it a rest. After the Florida fakery, there were many people calling for guns to be allowed in schools, and for teachers to be armed. Like clockwork, as soon as they could possibly set it up, CNN backed fakers are faking it yet again, but this time it is a teacher in Dalton Georgia, who fired shots (probably blanks) in a classroom. Teacher captured. No one hurt. Here's the twitter stream from the police department. 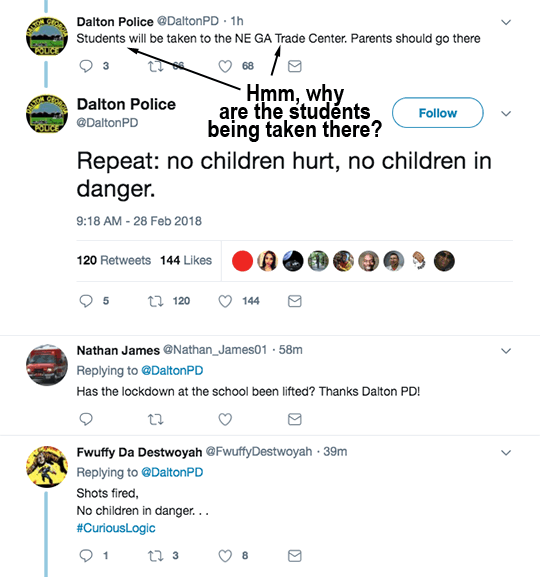 GET THIS: Even in the first tweet it says no children are in danger! The first tweet, at 9:16 AM. How would the police know that? Bullets go through walls you know, and the kids were not out of the school yet, and they did not have the guy in custody yet, so HOW, PRAY TELL, could they tweet that no one was in danger??!!?? YOU GUESS. Obviously what we have with this is an excuse to not allow teachers to be armed. There was too much discussion about putting guns in the schools, and this is the libs attempt to quash that discussion. Here's the story line prediction: It will be a substitute teacher with a history of mental illness who shot up a classroom with a h and gun and missed everyone. Therefore we need mental health checks, and school zones have to be gun free. Waiting . . .Waiting . . .